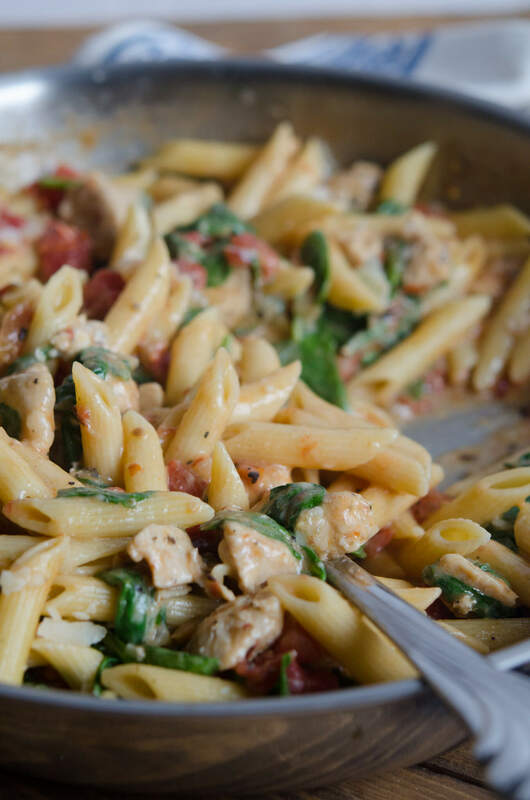 I’ve got a plan for dinner tonight that involves a simple list of ingredients including pasta, chicken, and fresh spinach. 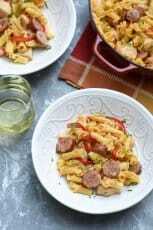 It’s made all in one skillet and it will be on your table in about 30 minutes. 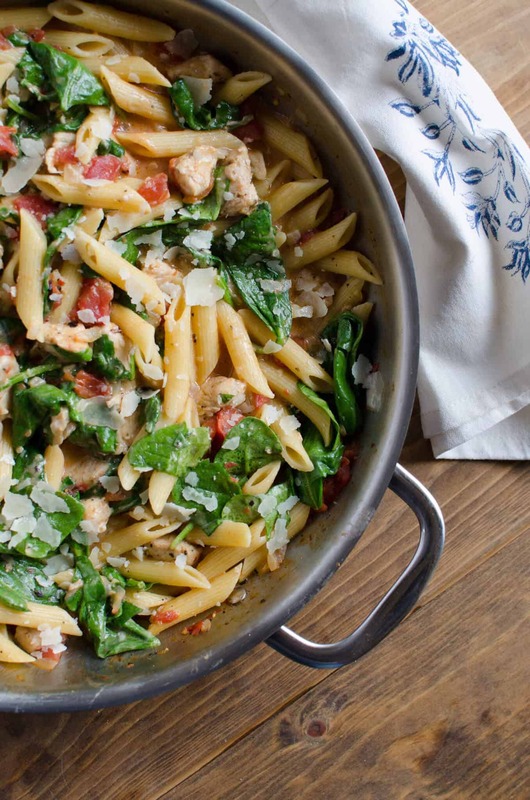 This Chicken and Spinach Skillet Pasta is what I call a solid plan. This post was originally published October 23, 2014 and has been updated with a new video. 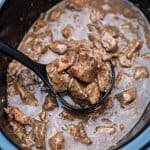 If you’ve read this blog for any length of time you know I’m pretty crazy about fast and easy one-pot meals. It stems from the “life is complicated, dinner shouldn’t be” philosophy that I’ve adopted over the years. After serving many of these simple, delicious meals to my family, I’ve determined that complicated does not necessarily mean better. 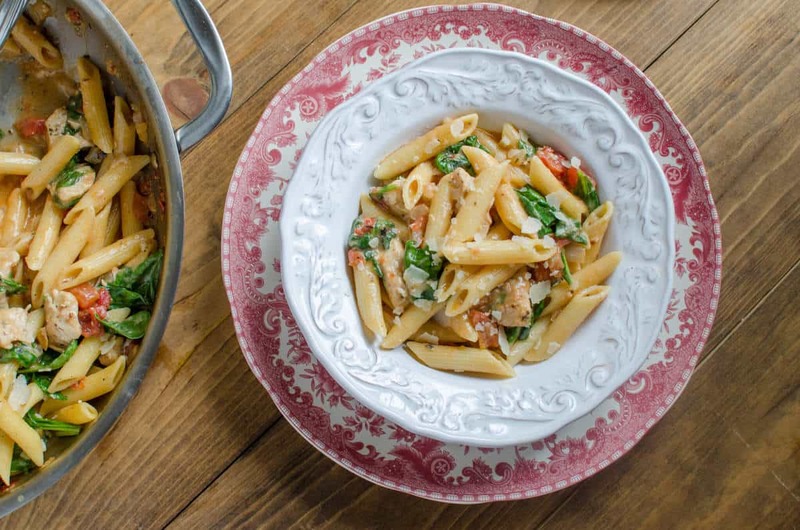 Ever since that momentous day when I discovered you could throw dry pasta into a pot with a slew of other ingredients and end up with a delicious result, things have never quite been the same around here. 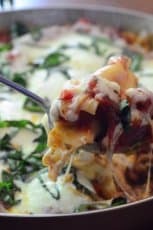 I’ve experimented with all kinds of different pasta, meats, and veggies and the recipe has risen to the top as one of my favorites. I hope you’ll try it and love it as much as we do! 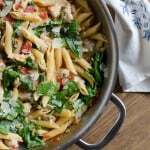 This Chicken and Spinach Skillet Pasta requires just one pan and 30 minutes to prepare! Add olive oil to a 12" deep skillet or saute pan and place over medium heat. Add the chopped chicken and cook, stirring frequently. 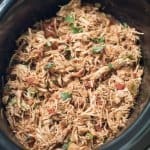 Sprinkle chicken with Italian seasoning, a touch of salt, and fresh ground pepper, and continue cooking for 3 or 4 minutes or until chicken is completely cooked through. Transfer chicken to a plate and cover to keep warm. Add remaining olive oil to pan and add onions. Cook for 2 or 3 minutes, until softened and lightly browned. Add garlic and cook for a minute or two until fragrant. Add broth, tomatoes, pasta, crushed red pepper, salt and pepper and stir to combine. Stir in the cooked chicken and bring to a boil, cover skillet, and reduce heat to medium-low. 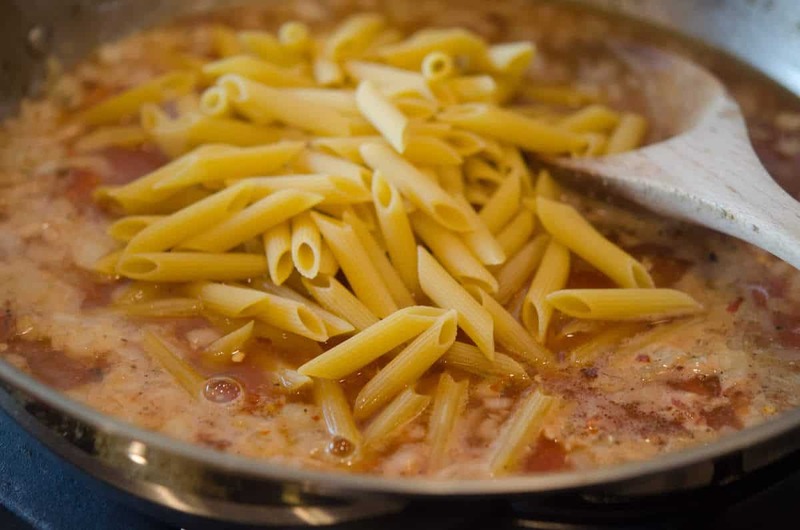 Simmer until pasta is tender, about 15 minutes. Stir in half and half and mozzarella and simmer for minute or two until warmed through and cheese has melted. Remove skillet from heat and stir in fresh spinach until it wilts from heat of the pasta. Top with Parmesan and serve. 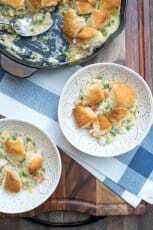 You are the first place I look to when I want to make a skillet dish like this. I’ve only made a couple but I was pretty excited when I first realized the pasta cooked in the same skillet as the sauce! Congrats on being on ehow!! Looks delicious..where is the recipe? It seems to be working just fine. Give it another try, Donna. I made this dish for my family for dinner tonight, in under 40 minutes it was ready and they absolutely devoured it!! My husband said it was better than any pasta he’s ever had at Olive Garden. Definitely a keeper! That is a wonderful compliment, Ashleigh! Thanks so much for coming back to let me know it worked out for you guys. I think I need to get this on our menu again very soon. Made this tonight. It was easy, excellent and a keeper for sure. Thank you for the recipe. The link to ehow is not working. Can you send me the recipe? Hello Lauren. I just checked the link and it worked just fine. Give it another try and let me know if you can’t get to the recipe. My boyfriend informed me that I need to cook more…and so I came across this recipe on Pinterest…and my boyfriend likes it. He’s eating it as I type this review. I added red pepper w the onion. I love red pepper so much I put it in everything. This recipe was easy to make and looks just like the picture. It’s a good hearty meal! I’ll be checking out and making a few of your other recipes. Valerie, I have been planning to make this recipe for a few days now. Initially, I was able to open the link, but today (as I’m about to make this for dinner), I tried 11 times and I get the same “oops” message that it can’t be opened. Very annoying! Bonnie, I am SO sorry! 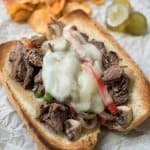 I have no idea why those links are no longer working but I’ve corrected the issue by adding the recipe right here for you. I apologize for the inconvenience. If the chicken is fully cooked why would you you add it in during the 15 minute simmering process? Overcooked? 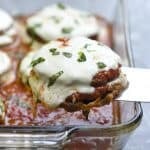 I make this with cut up chicken thigh for more flavor, add Boursin herb and garlic cheese for more body in the sauce. Chicken is added with the spinach to arm through. 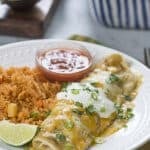 Would this dish freeze well? Hi Valerie, this looks wonderful. Any suggestions on how to cook substituting chicken with shrimp? Hi Lydia. I would do it just as written, substituting uncooked, peeled and deveined shrimp for the chicken. It will take just a couple of minutes to saute the shrimp. Remove them from the pan when they are pink on all sides. I wouldn’t add them back until the last 3 or 4 minutes of the cooking time to avoid having them get overcooked. Let me know how it turns out if you try it! Just made it! It was fantastic!! OMG this was so delicious! Absolutely the best so easy and everyone loved it! Hello Leigh. Half and half is a blend of half whole milk and half light cream. 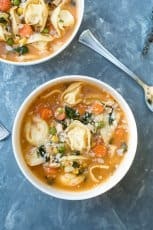 It is too light to be whipped but I love to substitute it for heavy cream in pasta and soup recipes to cut down on the fat content a bit. It’s still plenty rich and works wonderfully in recipes like this. Feel free to sub heavy cream if you wish. This sh was fantastic! I didn’t add the half and half and it was very creamy; saved calories! We loved this! Adding it to our menu of commonly cooked dinners. My 5 yr old and picky adult child loved this. Thanks! Absolutely delicious! I’ve made it four times now and it’s a winner. YAHOO! Another one pot dinner recipe. 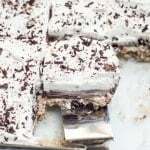 My husband loved it and he is super critical, coming from an Italian family. I was lazy and used pre-cooked chicken strips, saving one step. But I did brown 4 strips of bacon to add to the mix. I also used diced canned tomatoes with basil, oregano and garlic. YUM!Thanks so much for this!